"The eyes of any healthy animal should never be closed shut other than for resting or blinking." 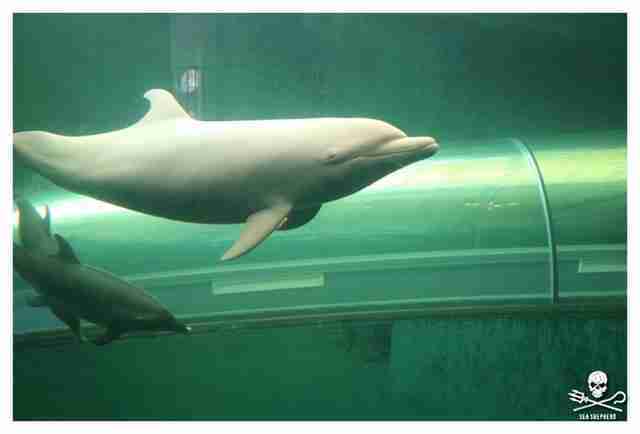 For Angel, a rare albino dolphin living in a tank at the Taiji Whale Museum in Japan, life is a living hell. In 2014, Angel was captured during the annual dolphin hunts in Taiji, where fishermen drive hundreds - if not thousands - of dolphins into a cove by hitting metal poles against the bottoms of their boats, interfering with the dolphins' sonar and trapping them within a "wall" of sound. Once rounded up, people choose the most attractive-looking dolphins to sell to dolphinariums and swim-with-the-dolphins programs around the world. The rest of the dolphins are brutally slaughtered for their meat, often in front of their own families. 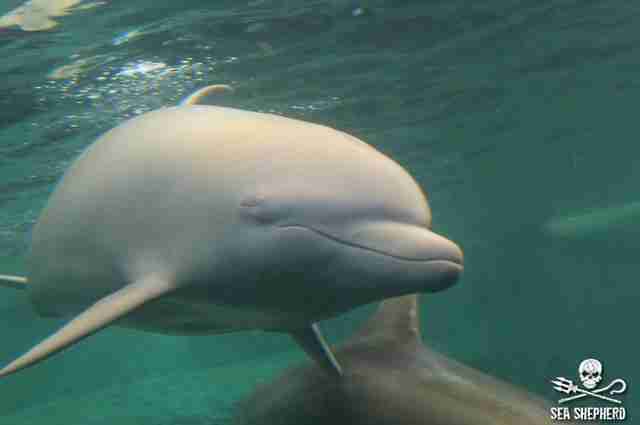 As an albino dolphin, Angel was viewed by the Taiji Whale Museum as quite valuable. But instead of selling her to a dolphinarium, The Taiji Whale Museum kept Angel at their facility, which displays both dead and living cetaceans, as well as whaling paraphernalia. Here, Angel has spent years living in a tiny, filthy tank filled with chlorinated water, which she shares with several other dolphins. Yet Angel's life recently got even worse. Now it appears that she can't even open her eyes, likely from the high levels of chlorine that fill her tank, according to activists. "I'm utterly appalled," Jessie Treverton, a campaign leader for Sea Shepherd Conservation Society Cove Guardians, told The Dodo. "I am guessing they have added too much chlorine to the tank and it's stinging the dolphins eyes." Angel's tank has always been chlorinated, but Treverton (who recently spent two months in Taiji) suspects the museum recently put more chlorine into the tanks in an effort to keep the glass tunnel - where people can view the dolphins - free from algae growth. "It's so they don't have to clean the tank so often and the public can get a clear view," Treverton said. "It's terrible for the dolphins' welfare, and it's totally unnatural and very unhealthy for the poor dolphins." Other Sea Shepherd volunteers have also visited the museum, and they were horrified at what they saw - and smelled. "Two weeks ago we documented the dolphins inside this filthy chlorinated tank with swollen eyes, skin that was eaten away at, not able to swim without jagged, unnatural movements," the Sea Shepherd Cove Guardians wrote in a Facebook post. "Since this last visit, the water in the tank has been re-chlorinated, evident to us as soon as we walked through the doors to the tunnel and smelled the overwhelming stench or chlorine." 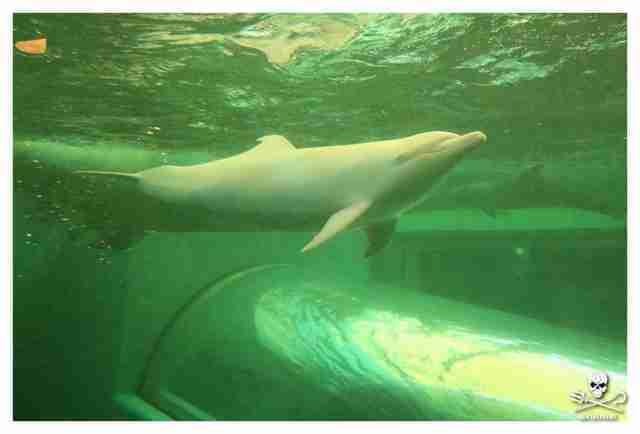 As an albino, Angel would be more susceptible to eye irritations from the chlorine, and Australia for Dolphins previously documented her as keeping her eyes closed inside the tank. But now, Angel seems to have her eyes closed all the time. 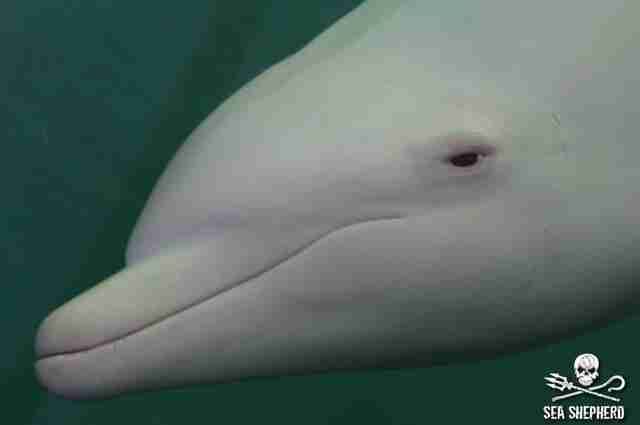 But it's not just Angel - in a recent video, most of the dolphins at the whale museum appear to have closed eyes. 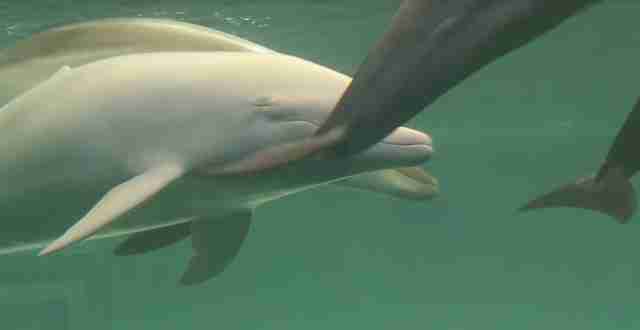 "What you see in this video are dolphins who are swimming blindly in circles, dolphins floating lifelessly on the surface, trying to keep their faces as close to the surface as possible to avoid the painful sting of chlorine," the Cove Guardians wrote. "What you see is blatant abuse." The high levels of chlorine in the tank could lead to long-term problems for dolphins, according to Naomi Rose, a marine mammal scientist at the Animal Welfare Institute (AWI). "In general, it's a quality of life problem," Rose told The Dodo. 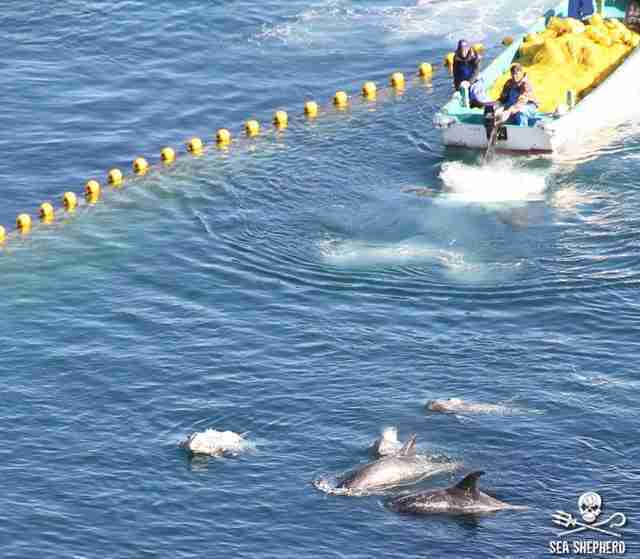 "The chemicals irritate the eyes, so in tanks where the levels are high enough, the dolphins keep their eyes closed. That's not good for them over the long term, as these chemicals can lead to permanent eye damage, other tissue damage and perhaps eventually long-term health problems from ingesting small amounts of water with their fish." Courtney Vail, a biologist and independent policy consultant, also believes that Angel's health could be in danger. "If we believe the reports of the teams on the ground there who are monitoring her and who state that her eyes are constantly closed, the condition is not normal and should be investigated by a competent veterinarian ophthalmologist," Vail told The Dodo. "It is possible that she could have either, or both, a viral or bacterial infection. And if either of those conditions go systemic, then her life could be in danger. The eyes of any healthy animal should never be closed shut other than for resting or blinking." Whatever is going on, Angel's situation needs to change quickly if she's going to survive. To help Angel and the other dolphins trapped at the Taiji Whale Museum, you can make a donation to Sea Shepherd Conservation Society. Correction: A previous version of the article stated that Courtney Vail believes "Angel's life may be in immediate danger." It also cited Vail as a marine consultant for AWI.